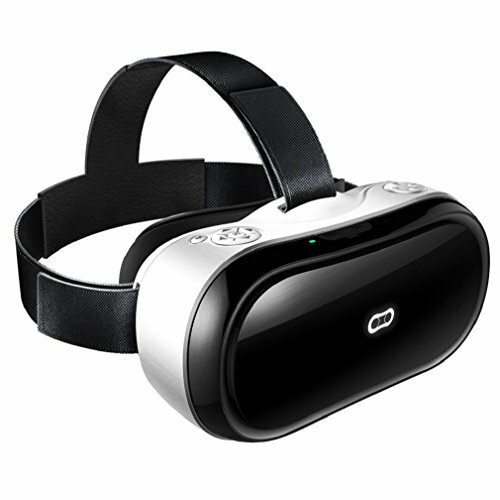 GBSELL 3D VR Glasses Headset Magicsee M1 All in One Virtual Reality Headset with 1080p WIFI Android 5.1 HDMI IN Higher FPS 2G/16G by GBSELL at Kode Fu Guru. Hurry! Limited time offer. Offer valid only while supplies last. Software Specifications: Compatible for Applications: Compatible with Nibiru customized 3D /2D apps, Google play, YouTube, Third party apps, etc. Compatible for Applications: Compatible with Nibiru customized 3D /2D apps, Google play, YouTube, Third party apps, etc. Sensor: Gravity & Gyroscope (6-axial sensor). Support Left/Right Half SBS wide 3D video. Compatible for platforms: Compatible with for XBOX/ Windows other platforms. Built-in 4000mAh rechargeable Li-polymer battery for long standby time. Earphone: Support (3.5mm standard output). Interface: 1 * Mini HDMI port; 1 * Micro USB port (Power Input 5V/2A); 1 * TF Card slot; 1 * Earphone Output jack. Buttons: Left Button: VO+/VO-/MENU; Right Button: Power / Back / Enter Button. Bluetooth, WiFi, 2G ROM / 16G RAM,CPU: RK3228 Quad Core ARM Cortex A17, Up to 1.8 GHz; GPU: Mali T764;Micro SD Card (Maximum support 64GB). High-density comfort sponge Edges around Face Mask & Adjustable Strips,Adjust the straps correctly before use, your head and neck will not feel sore from having that weight pulling down on your face.Myopia less than 600 degree is ok to use this item without wearing glasses. Compatible for Applications: Compatible with Nibiru customized 3D /2D apps, Google play, YouTube, Third party apps, etc. Compatible for platforms: Compatible with for XBOX/ Windows other platforms.